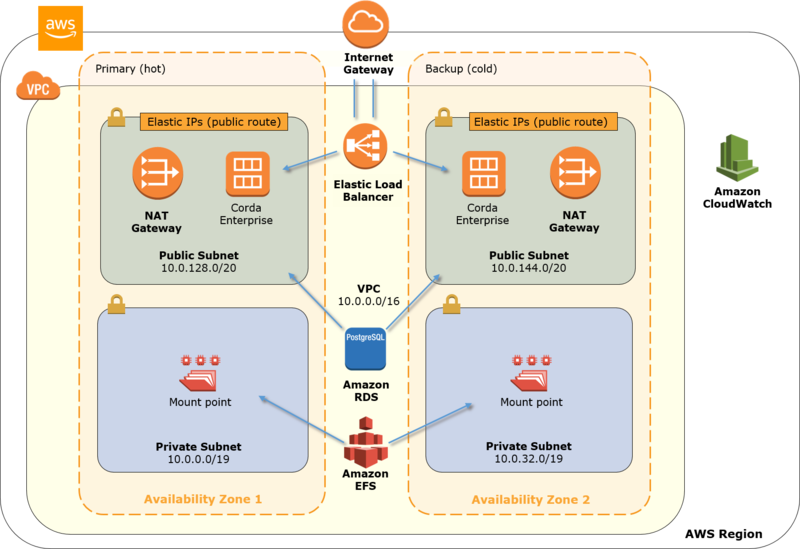 This Quick Start automatically deploys a Corda Enterprise node in a new or existing virtual private cloud (VPC) on the AWS Cloud in about 30 minutes. Corda is a blockchain technology platform built to transform the way the world does business. Using smart contract and blockchain technology, Corda allows existing business networks to reduce transaction and record-keeping costs and to streamline business operations. Corda Enterprise on AWS is a production-ready implementation of a Corda Enterprise node, which offers built-in resilience and high availability and which can scale as the needs of the node operator change. This Quick Start is for IT infrastructure architects, administrators, DevOps professionals, CorDapp developers, or business users who are planning to implement a Corda Enterprise node deployment on the AWS Cloud. A logical Enterprise Corda node with hot-cold instances across the two Availability Zones. Security groups for each instance, which restrict access to only the necessary protocols and ports. Elastic Load Balancing (ELB) load balancers to load-balance remote procedure calls (RPCs), and P2P traffic over TCP to the highly available Corda node instances. An Amazon Relational Database Service (Amazon RDS) PostgreSQL managed database instance configured for the Corda Vault and pertinent node state. An Amazon Elastic File System (Amazon EFS) instance shared by the instances across Availability Zones. Amazon CloudWatch logging of resources and Corda node. You are responsible for the cost of the AWS services used while running this Quick Start reference deployment. There is no additional cost for using this Quick Start. This Quick Start includes a 60-day trial license that provides limited access to Corda Enterprise features. The terms of the license can be found on the R3 website. To utilize the deployment created by this Quick Start after this trial, you will need to obtain a Corda Enterprise license by contacting sales@r3.com.